Hello, it's Maureen with another Throwback Thursday post! This month I am featuring Very Vintage Florals, Very Vintage Floral dies and the Label Layers 3 die as my throwback products. Very Vintage Florals is the perfect set for simple Spring themed cards. 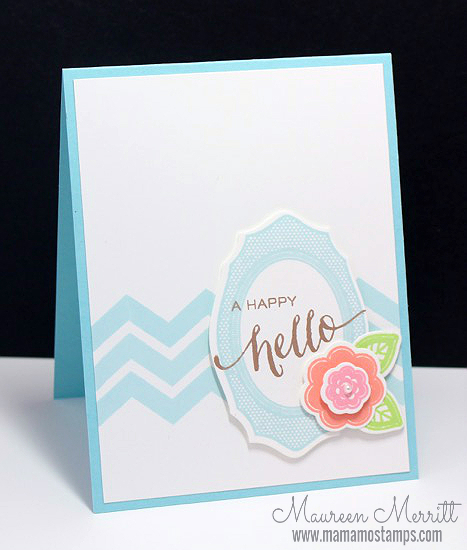 While I love two and three step stamping, it's nice to stamp with a solid image too. The label included in this set makes for the perfect focal point. You'll see in my card set today, I've used a beautiful Spring color combination of Lake House, Sweet Nectar, Little Piggy, Beanstalk and Coconut Husk PURE COLOR die inks. The colors from each of the collections work brilliantly together! To start trio of Very Vintage Florals cards, I used my go-to layout. Beginning with something that you know works for you is a great way to jumpstart your creativity. The florals in this set are perfect for layering over one another. For my second card, I flipped the orientation and rather than die cutting and popping up the Label Layer 3 die like I did in the first card, I placed it in the negative space. Using negative space is a great way to add interest without adding layers in your CAS designs. 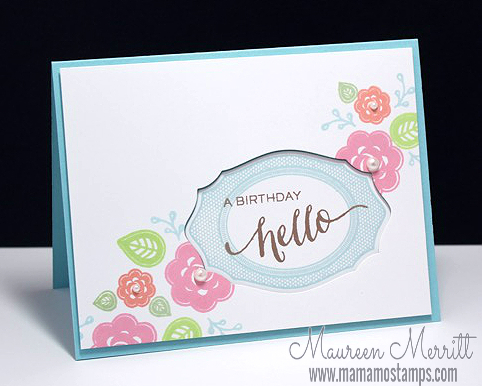 I added the stamped florals across the card to add movement and flow to the design. On this card I added Mojito ink into the color mix and it works wonderfully. For my last card, went back to my go-to layout and stepped up the design a bit by stamping the entire background with Borders & Backgrounds 2, using a larger font and adding more florals to the frame. EXTRA ENTRIES: Post your creations on Instragram using the hashtag #wplus9tbt for an extra entry! Hello ladies (and gents)! 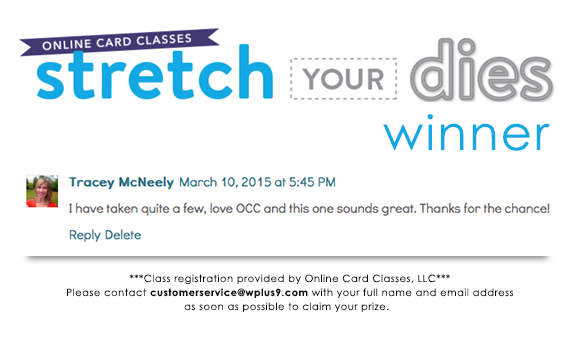 We have a winner for the Online Card Classes - Stretch Your Dies class! Please send an email as soon as possible to customerservice@wplus9.com, Subject: OCC - Stretch Your Dies Winner, so that we can get you in contact with Online Card Classes to claim your prize. I love die cutting—and I’m always looking for new ways to use my die-cutting machine and dies to make cards. The girls at Online Card Classes felt the same way! 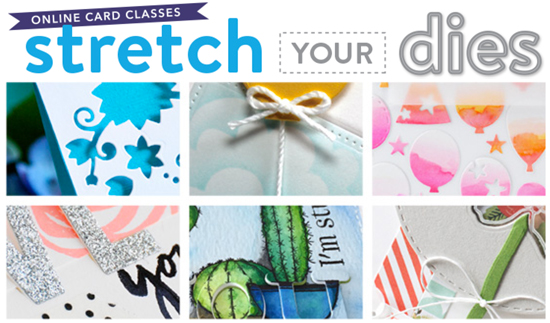 Their new class, Stretch Your Dies, is all about discovering new, cool ways to use dies for card making. It’s based on the same concept as their popular Stretch Your Stamps class—each day the class will focus on a different kind of die, so it’ll be easy to find a die or two in your stash to follow along with. The class will have 20+ videos! For more information, visit Online Card Classes. Registration for this class is now open, and I’m thrilled to announce that I’m one of the guest artists for Stretch Your Dies! But even better… one of you will get to attend for free! Just leave a comment on this post by Thursday, March 12th to be eligible. 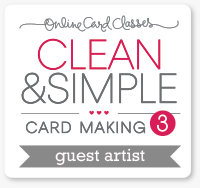 I'd love to know which was your favorite Online Card Class and/or which one you'd love to take/see next. Winner will be selected by random from all comments and posted here on the blog Friday, March 13th. Hello! No cards or projects to share today, just popping in with some updates. We have several more arriving, I think that I have finally made it onto a schedule of restocks arriving every week - every two weeks. In case you missed it, there is a new challenge. Maureen is hosting a Throwback Thursday Challenge on the third Thursday of each month. 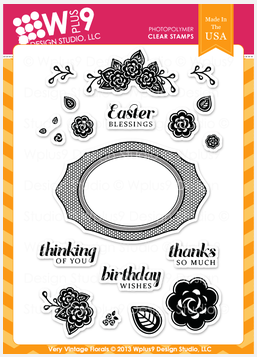 She will posting three cards, each using the same basic layout and design elements featuring a "throwback" stamp set. And you are invited to play along! Feel free to use any of Maureen's card as inspiration, or even the featured stamp set if you've got it. Use at least one Wplus9 product and upload your project to your blog or online photo gallery such as Flickr. Then link it up using the InLinkz widget on each post. There is a $20 store credit at wplus9.com each month for one random participant. Sound like fun? There is still time to participate in this month's challenge, click here to check it out. The idea is to color something everyday even if it’s for five minutes. Just five minutes that’s it. Some days you or I will have more time and that’s even better.It’s just about adding more time to color and carve out a little time for something that makes you happy. I think it is so important to practice and to encourage each other. No one is ever amazing at anything the first (or third, or fifth time) time they try it. With practice though, we get better and better. And honestly, if we are having fun...who cares if its "good" or not! Right? I think that this challenge is perfect for encouraging all of us to just create - no plan needed. I will definitely be playing along on Instagram. Be sure to check out all of the details here on Kathy's blog. We have a lot of really exciting stuff on the horizon here at Wplus9. Thanks for stopping by. I hope your week is off to a great start!